Jason Kaiser joined the Department of Atmospheric Sciences in November 2015 as the Atmospheric Sciences Data Systems Administrator. In this role, he manages the Atmospheric Sciences computer labs, servers, weather balloon systems, and Lyndon mesonet weather stations. 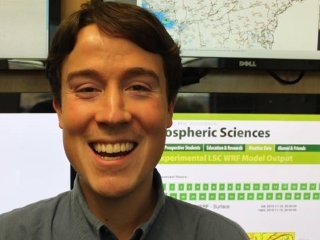 He also supervises student workers and is the webmaster for the Atmospheric Sciences website. Jason has Bachelor’s and Masters degrees in Applied Meteorology, and seven years of professional experience as an IT help desk supervisor. Before coming to Lyndon, Jason worked as a weather forecaster at a private weather company. Jason is passionate about making meaningful steps towards mitigating the effects of climate change. He has participated in the Climate Consensus group on campus, as well as attending rallies in Montpelier and Washington, D.C. Jason and Castleton University Associate Professor Brendan Lalor facilitated a Fossil Free VSC group, which worked with the Vermont State Colleges Facility and Finance Committee and the VSCS Board of Trustees to shift a portion of the VSCS endowment funds to fossil-free investments. The Board also agreed to provide low- and no-carbon retirement investment options for all VSCS employees. In his spare time, Jason enjoys music, including singing in the North Country Chorus, Cantate!, and as a choir member at the First Congregational Church of Lyndonville, as well as directing the Lyndonville Military Band in the summer months. ©2019 Northern Vermont University. All rights reserved.